Most memorable childhood moments were established from MJ’s song Beat it! This is my food tribute to a musical legend. 4 to 5 red and golden beets (2-3 of each kind). Peel and cut in 2 inch cubes. 450 to 600 g Arugula Salad or spring mix. 1/2 cup cooked cous cous. Dash of cinnamon and red chili flakes. 1. Place beets on baking sheet. Drizzle with olive oil. Bake for 1 hr at 350 degree farenheit. 2. Make the dressing by mixing all the ingredients. Set aside. 3. In a pan add brown sugar, cinnamon and chilli flakes. Add pecans. Cook on medium to glaze pecans. Add water if needed to melt the sugar. 4. Once beets are cooked. Take out if oven and allow to cool. Wipe any excess water with paper towel. 5. Once all ingredients prepared, get ready to assemble your salad. 6. Toss the greens and cous cous in the dressing. I use enough to just coat the greens. You may store any leftover dressing in the fridge. 7. 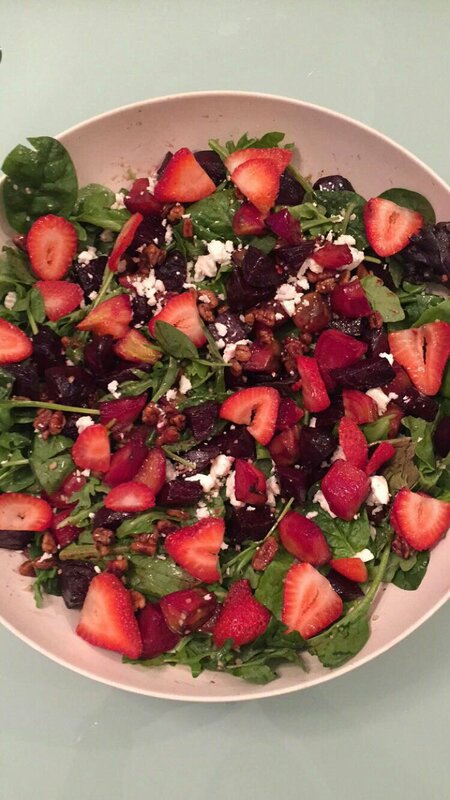 Now add beets, pecans, feta and strawberries on top of coated greens.